Happy New Year! So as promised, here is a blog post on the new plans and my thoughts on it. As I mentioned in a previous post, I’ve put a lot of thought into whether I wanted to blog about the new Slimming World plan. I’ve seen all the public SW Facebook groups, I’ve been on the website and gone through my book re-reading everything. Just remember I’m not a consultant, this is just what I’ve picked up from the books, website and from going to group. If you are a member (group or online) there is a really good new members talk here. I found it useful, and if you’ve gotten your pack and your consultant isn’t going through it until after the New Year, this is a great place to start. Please note that any photos below I’ve found online through Facebook groups. They aren’t mine and are just to help illustrate the new plans. Symbols have changed. I actually didn’t realise there were as many symbols as there were. There are now four: speed, protein, fibre and calcium. The rules haven’t changed. 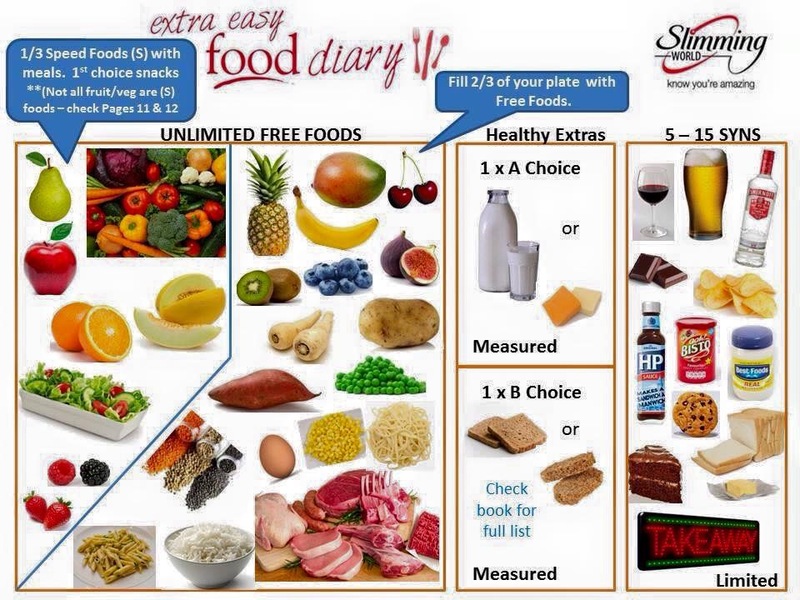 As there is no longer superfree, a third of your plate must consist of speed items (most fruit and veg). You still get 1 healthy extra A and B and 5-15 syns a day. Some syns have changed. This is because SW now have updated information. It mainly affects takeaways (before the syns were for half portions but let’s be honest, most of us eat the whole thing) and alcohol is reflected more accurately as the higher the alcohol content, the higher the syns (rather than lumping it all together). I would personally double check all syns for the first few weeks just to make sure. I’ve heard that red (original) and green plans no longer exist. Is this true? Yes it is. To streamline and make it easier for everyone, red and green plans will have a less prominent role and I guess less support as the consultants and the website will focus more on the new plans. However, the plan which replaces Success Express is quite similar to red. Those who follow the green plan may not be happy with the new changes but if you are able to adapt I think it will boost your weight loss. If you are a group or online member, there is a good feature on someone who has adapted from green to the new EE plan. What is replacing Success Express? The replacement for Success Express is the new Extra Easy SP plan. It is recommended to do a week at a time or to intersperse with the EE plan throughout the week. IT IS NOT COMPULSORY. – Eat speed and protein foods only at meals 50:50. – All snacks should be speed foods if possible. One question I saw crop up day after day was what if we want to eat free foods which are not a speed or protein food? 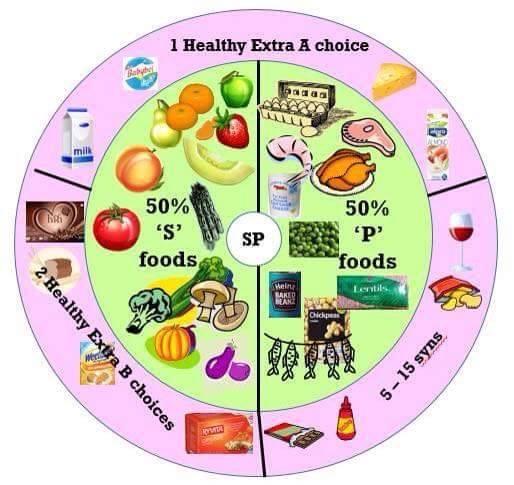 You don’t have to syn it BUT it means you will not be following the SP plan 100% (e.g. one meal of three has no speed or protein foods so you will only be following the SP plan 66%). What I would do is if I had a craving for potatoes, for example, than I would eat it but it would be an EE day with extra speed and protein foods rather than an SP day. So, I hope this answers some of your questions. I’ve heard that there are quite a few offers in various magazines so you would only pay £4.95 for the first week so you can get your new pack and hear all about the new plans in class (no obligation to carry on going if you wish to do it from home but it will save you £15 as I’ve seen the new packs on eBay). I think this week’s is in the Woman magazine and someone else mentioned that there’s voucher in the Mirror newspaper from 3rd-6th Jan (the voucher is definitely in the Saturday & Sunday ones not sure what other vouchers are in there). If you do have any questions, I’ll try my best to answer if you leave a comment in this post. I hope you’ve found it useful if you’ve seen other information out there with no clear explanation and are in a bit of a panic (as I was before I got my pack and everyone else was discussing it!). Tomorrow I will be posting on the little extra boost I’m giving myself to make sure I stay on track in the New Year. « Emotional Eating – Why I Binge. Hi, I have been following your reports, finding it very interesting. I used to go to Slimming World for 3 years, i normally followed red or green. 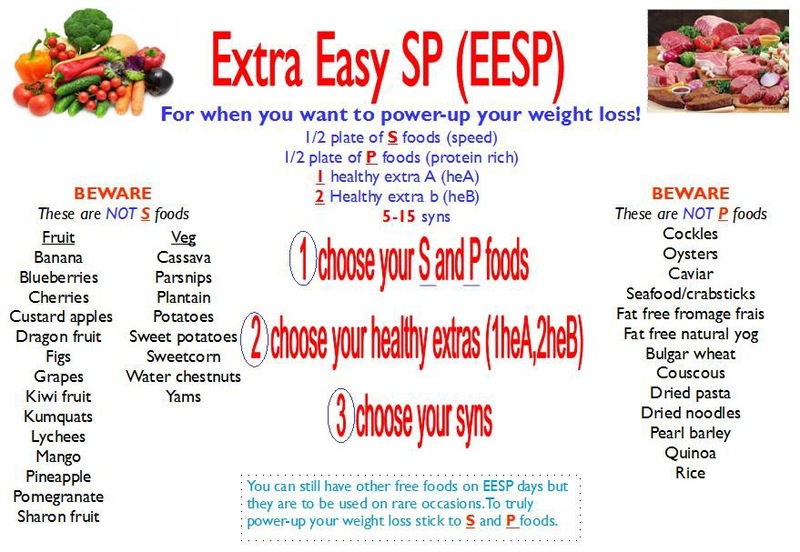 I want to know more about EESP, what are the foods for S and P, i do not have a new SW book. As joining is difficult. Thank you for your comment. I’m glad you’re finding these posts useful. If you have facebook, there is a link of a list of S and P foods here. I have joined up on FB, Roxy Patel. Hiya, I just wanted to know why you couldn’t have a synned yogurt on a SP day? You can have synned yoghurts. It’s just syn free yoghurts which aren’t included. I asked my consultant the same question and all she came back with was I can have synned yoghurts if I am only doing SP 1/2 not 100% but if they are synned yoghurts to start I don’t see the problem?